A longer time ago than I’m willing to admit, I first learned how to bake with my father. 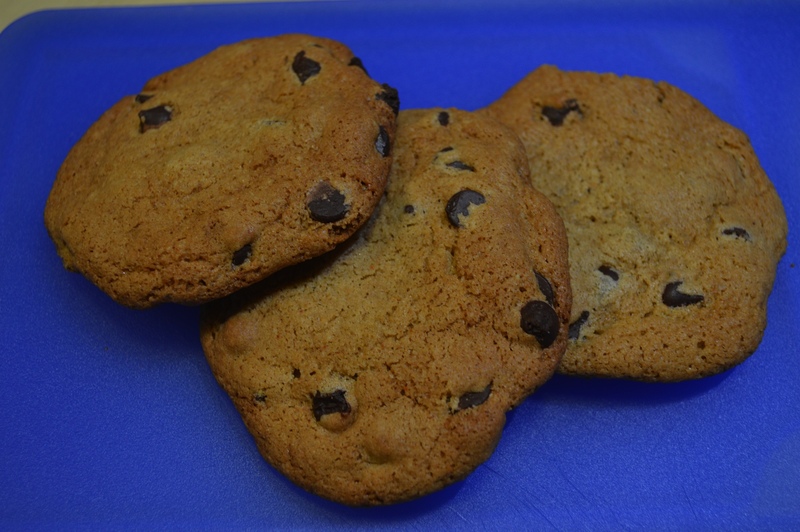 And the first thing I baked—Toll House® chocolate chip cookies. They were thin, crisp, and probably too sweet for my taste today, though I didn’t think so at the time. Baking with my father was quite an experience. He baked like a chemist, measuring out every ingredient first. He’d make sure that one cup of flour was exactly one level cup, no more, no less. Then he’d line up all the ingredients on the counter in order of when they needed to be added. My style is more like organized chaos in comparison. I usually measure on the fly, and I never use a spatula to level out my cups of flour like he did. I just eyeball it. Sorry Dad. Since the days of baking with my father, I’ve concluded that thin and crisp are not my favorite. Chocolate chip cookies can be thin and crisp, soft and puffy, and everything in between. For my taste, I like them in between, not too thin and not too puffy. When I bite into a cookie, I want a crisp outside and a soft, somewhat moist inside, but I don’t want it to have caky texture like many puffy cookies have. I searched for the perfect chocolate chip cookie recipe, but I never found one I loved. So, with a little research into the chemistry behind cookies, I created my own recipe. My cookie baking came to a halt when my oldest son was diagnosed gluten intolerant. A few months ago, my youngest son asked for cookies because it had been too long since I baked them. I broke out the old recipe and thought, You know, these really are yummy. But then I thought, why not create a gluten-free version. It took several months of experimentation, much to my husband’s chagrin (something about not being able to stop eating them). *Many chocolate brands have soy lecithin. If you are soy free like me, read the labels. A few brands do not use soy. **Vanilla extract is usually blended in bourbon. Most bourbons use gluten grains, however, it is believed that the fermentation process destroys the gluten protein. If you suffer from celiac and do not want to take the risk, you may want to use one fresh vanilla bean. 2. Combine gluten-free flour, almond flour, xanthan gum, baking soda, cinnamon, cayenne, and cloves and set aside. 3. In a separate bowl, cream butter, shortening and sugar until light and fluffy. 4. Add brown rice syrup, egg, and vanilla to butter mixture and beat well. 5. Add flour mixture one tablespoon at a time and mix slowly between additions. 7. Place batter in refrigerator. 8. Line a sheet tray with parchment paper. 9. Place batter in an ice bath and spoon balls of batter about 1½ to 2 inches in diameter onto the tray. Flatten balls of batter slightly. 10. Bake for about 10-12 minutes or until golden brown. 11. Place cookies on a cooling rack until cool enough to eat.